U.S. Navy F/A-18 Hornet strike fighters flying from the deck of USS George H.W. 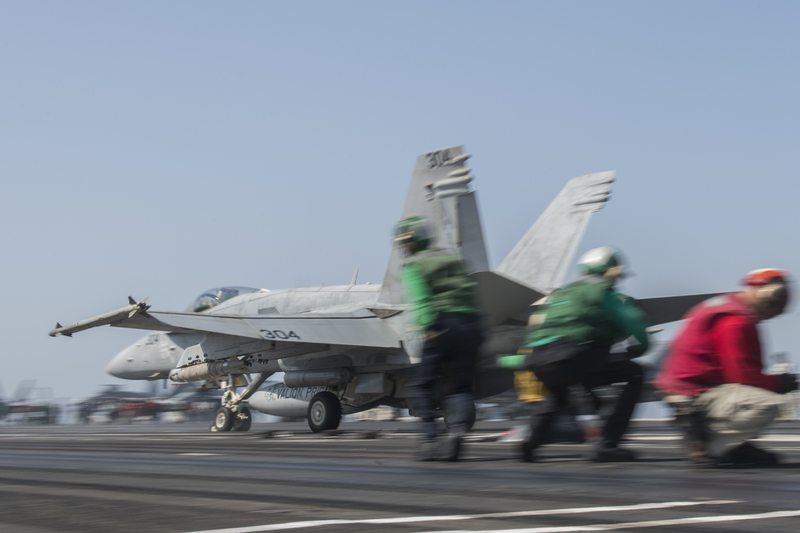 Bush (CVN-77) have flown 30 air strikes against Islamic State of Iraq and Syria (ISIS or ISIL) terrorists since Aug. 8. but more sorties are geared toward surveillance, officers on Bush said on Wednesday. American air power has hit the terrorists 84 times across Iraq since U.S. President Barack Obama authorized the use of military force to protect U.S. citizens and facilities in Iraq according to the Pentagon. Of those air strikes, 51 have been in support of Iraqi forces near the Mosul Dam. “We have been involved in approximately 30 kinetic events,” said Capt. D. L. Cheever, commander of Carrier Air Wing Eight onboard George Bush during a Wednesday teleconference with reporters. Rear Adm. DeWolfe Miller, commander of Carrier Strike Group Two — also on the same telcon — could not say how many sorties Bush launched in a given day, but said that the carrier could significantly ramp-up its sortie generation if there was a demand for more strikes. Cheever said the bulk of the sorties flown from the carrier were non-traditional intelligence, surveillance and reconnaissance (ISR) flights where weapons were not dropped. Presumably, the Boeing-built Hornet and Super Hornet strike fighters used their APG-73 and APG-79 radars and ATFLIR pods to perform that role, Cheever declined to confirm. Cheever also declined to say what if any kind of resistance the Navy fighters faced or would he say if the ISIS terrorists were adapting to the American bombing campaign. Nor would Navy officials comment about how much coordination there is between U.S. forces and the Iraqi military in conducting the airstrikes. Cheever did confirm that the Grumman EA-6B Prowler is flying in support of the Navy’s air operations. However, he would not comment on exactly what role the venerable jet—which is on its last carrier-based cruise—is playing in the campaign. Given that the surface-to-air threat is probably close to non-existent, the Prowlers are likely jamming ISIS communications on the ground with their powerful electronic attack capability.